Eli playing with a great toy library borrow. We have a local toy library. It’s a great idea – for a small fee each year you can borrow up to 5 games and toys each month. There’s a good selection, lots of baby toys as well as games and puzzles for older children. It’s especially good for borrowing the types of toys – rocking horses, walkers, baby swings – that are expensive but aren’t really used by kids for long enough to justify the expense if you’re watching the pennies. Plus you get to see if your child actually likes a particular toy that you perhaps were thinking of buying to save yourself a costly mistake when it turns out they hate it. Today was our monthly visit (with some baby group friends). The volunteers were on good form as usual – I’m not sure about other toy libraries but ours is primarily staffed by well-meaning middle-class women of a certain age (and apparently at least one man but I’ve not met him). When you arrive someone eventually notices you are there and demands your name and marks you in the register. All records are paper based and index cards contain all the details of the items you have borrowed along with your contact details. If there are more than one or two people borrowing/returning items chaos begins to descend. At least one volunteer will begin to flap as index cards are sought and names are muddled. I have learnt to stand back and wait because eventually calm will return and once items are returned new items can be sought. I particularly like to borrow games for the big kids – there’s a handful of Orchard Toys games available and these have generally been good fun (at least the first few times, perhaps not the hundredth). The one month return rule benefits me here as I can return games before they become too annoying to play again and get something new. 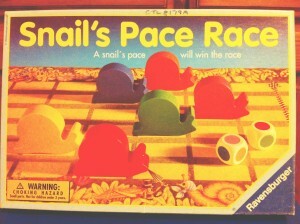 Today I spotted something that I had to bring home – Snail’s Pace Race bills itself as a ‘non-competitive game. My kids are somewhat competitive – I wanted to see if they would thwart the worthy aims of this game. The basic idea is that you shake the dice and move the appropriately coloured snails forward depending on the colours you roll. You try to work out which will win and the participating children cannot win nor lose themselves. Lex thought this was fun. Tilly had a tantrum because the pink snail was not winning. I suppose at least they weren’t competing against each other, only Tilly competing against the other snails… Perhaps next time I’ll borrow ‘Pop to the Shops’ again as, despite being competitive, the only tantrums were thrown when I refused to play again (and again and again). The toys I borrowed for Eli are more successful. He enjoys the ring stacker and a good-sized bead frame. Despite owing a lot of baby toys already, Eli’s interests are slightly different to his older siblings’ and this resource means a range of toys he will love at next to no cost to me – win, win. So, another month and we’ll be back to the toy library, I wonder what we’ll find then? 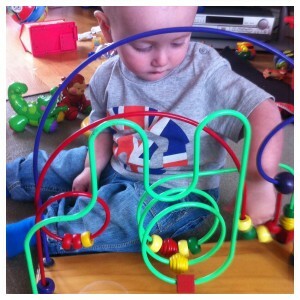 This entry was posted in Bits and bobs, Kids and tagged competition, eli, games, lex, tilly, toy library by twigletmac. Bookmark the permalink.